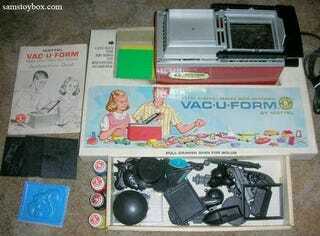 Apparently, this kid-oriented Vac-U-Form toy involved creating your own plastic toys using molds and an exposed hot plate. It's safe to say that in today's litigious society, this would not have lasted long. So basically, you would heat up the sheet of plastic on the hot metal surface, then flip the frame holding the plastic over, where it would fall onto the mold. You would then crank a lever down to create a vacuum between the mold and the plastic. After letting it cool down, and cutting off the excess plastic, you would be left with a well formed toy (or the parts to assemble one. You could even drop your own items in there to serve as molds.